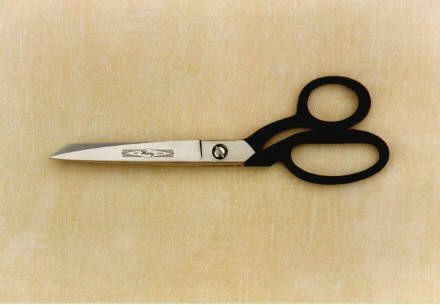 The firm of William Whiteley & Sons (Sheffield) Ltd, Manufacturers of Fine Scissors, commenced the manufacture of scissors in the year 1760, the business passing in direct descent through eleven generations to the current day. The company is justly proud of its reputation for quality, founded in those far off days and endeavours to maintain and improve upon it, offering a product range to match the requirements of companies working with modern materials. All product is fully guaranteed against faulty workmanship and materials. 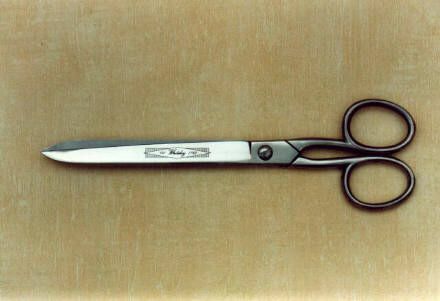 Surgical grade stainless steel blades. Comfortable ergonomic handles made from a dishwasher-proof high quality plastic. Hollow ground blades - adjustable pivot. Suitable for the following; Carpet and underlay, textiles, synthetic textiles, card, paper, leather, rope, silks, canvas, rubber, food preparation etc. The back of the shear is flat and will sit on a surface and can be used like a larger more expensive tailors shear but with out the weight. 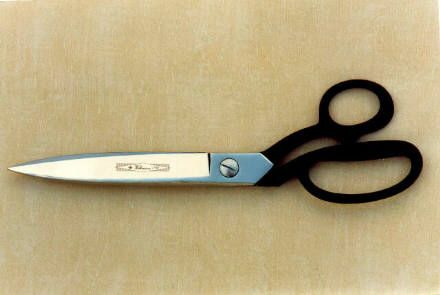 An excellent light shear with the power to cut. 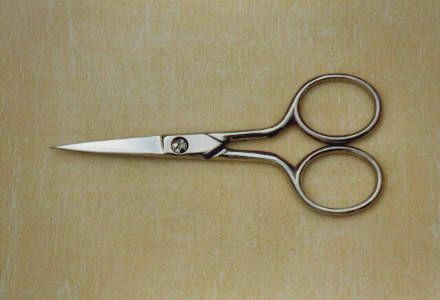 Nickel plated blades Two sharp points Suitable for the following; Fine threads, textiles, applications requiring intricate detail. The two sharp points allow greater accuracy working with machines and when cutting into a corner or confined space. 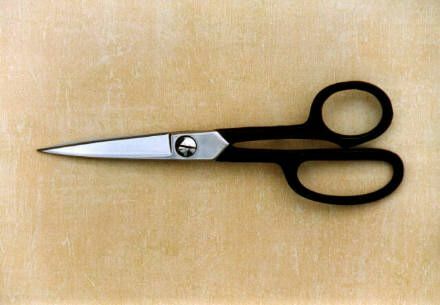 Polished "Bright Steel" blades. 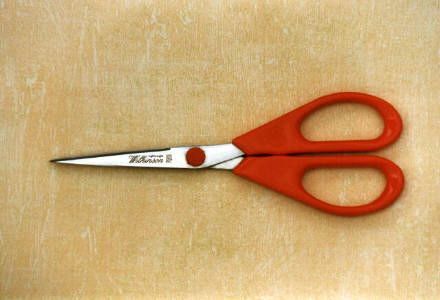 Suitable for the following; Textiles, threads, paper, thin card, finishing, general purpose office duties etc. 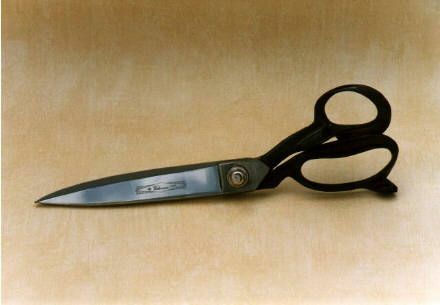 Polished "Bright Steel" blades Two sharp points Suitable for the following; Fine threads, textiles, applications requiring intricate detail. The two sharp points allow greater accuracy working with machines and when cutting into a corner or confined space. Polished blades & cranked handles. High carbon tool steel. One blade micro-serrated - one blade with a knife edge. Suitable for the following; Leather, textiles, synthetic textiles, canvas, rubber, carpet & underlay, felt, rope, plastic film, paper & card etc. 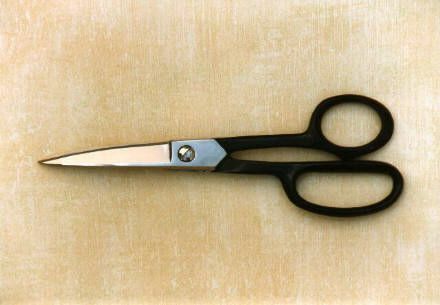 Cranked handle allows close trimming without operators hands getting in the way. 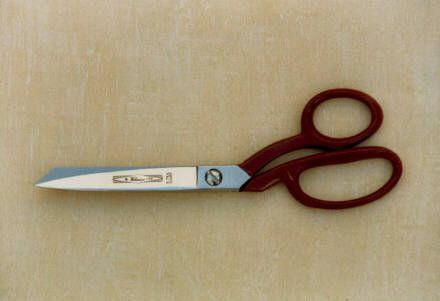 Polished curved blades. High carbon tool steel. One blade micro-serrated - one blade with a knife edge. Suitable for the following; Leather, textiles, synthetic textiles, canvas, rubber, carpet & underlay, felt, rope, plastic film, paper & card etc. 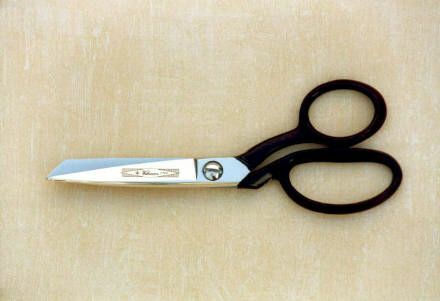 Curved blades allow close trimming without operators hands getting in the way. Pinking Shears. Made in Sheffield England . A good solid cast chromed steel pinker in the traditional style. 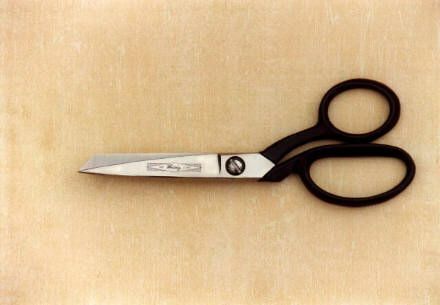 Polished "Bright Steel" blades. 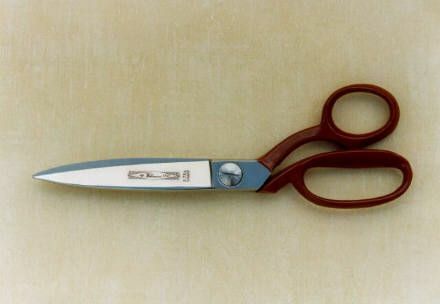 Offset handles. Adjustable pivot screw and locking nut. Suitable for the following; Textiles, synthetic textiles, canvas, rubber, carpet & underlay, felt, rope, plastic film, paper & card etc. Chrome plated blades with unique corrosion protection on the inside. High carbon tool steel. Offset handles - machined pivot screw. Suitable for the following; Textiles, synthetic textiles, canvas, rubber, carpet & underlay, felt, rope, plastic film, plastic & fine wire mesh, paper & card etc. Longer life is achieved by higher grade materials and more finishing processes. Chrome plated blades + unique corrosion protection - High carbon tool steel. One blade micro serrated, one knife edge. Offset handles - machined pivot screw. Suitable for the following; Textiles, synthetic textiles, canvas, rubber, carpet & underlay, felt, rope, plastic film, plastic & fine wire mesh, paper & card etc. Longer life is achieved by higher grade materials and more finishing processes. 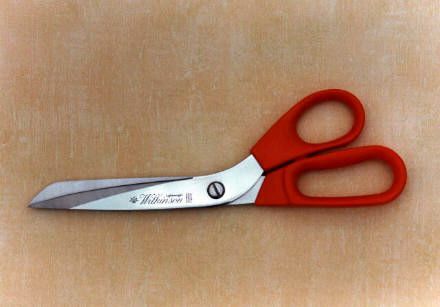 The combination of a micro-serrated blade and a knife-edge blade allow the trimmers to grip slippery materials as the knife edge reduces the cutting effort required. True (LEFT HANDED) Chrome plated blades + unique corrosion protection - High carbon tool steel. One blade micro serrated, one knife edge. Offset handles - machined pivot screw. Suitable for the following; Textiles, synthetic textiles, canvas, rubber, carpet & underlay, felt, rope, plastic film, plastic & fine wire mesh, paper & card etc. Longer life is achieved by higher grade materials and more finishing processes. The combination of a micro-serrated blade and a knife-edge blade allow the trimmers to grip slippery materials as the knife edge reduces the cutting effort required. Chrome plated blades + unique corrosion protection - High carbon tool steel. One blade micro serrated, one knife edge. Offset handles - machined pivot screw. Suitable for the following; Textiles, synthetic textiles, canvas, rubber, carpet & underlay, felt, rope, plastic film, plastic & fine wire mesh, paper & card etc. Longer life is achieved by higher grade materials and more finishing processes. 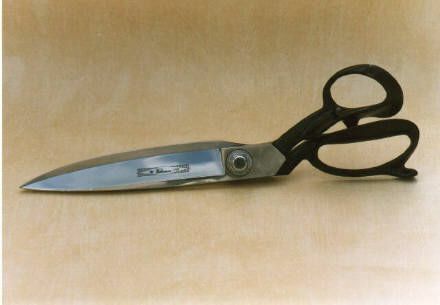 The combination of a micro-serrated blade and a knife-edge blade allow the trimmers to grip slippery materials as the knife edge reduces the cutting effort required. Chrome plated blades with unique corrosion protection on the inside High carbon tool steel. Offset handles - machined pivot screw. Suitable for the following; Textiles, synthetic textiles, canvas, rubber, carpet & underlay, felt, rope, plastic film, plastic & fine wire mesh, paper & card etc. Longer life is achieved by higher grade materials and more finishing processes. 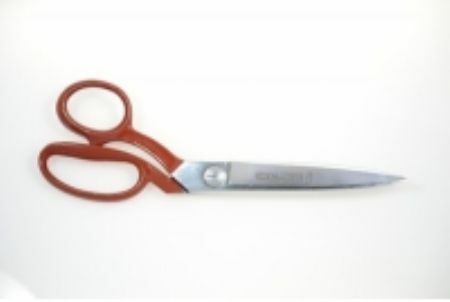 High carbon tool steel blades Ground and set by top craftsmen Extra wide handles with thumb rest Big pivot bolt to allow upright storage Manufactured in the traditional hand-made way by the most skilled craftsmen, these shears are designed to give excellent balance and comfort. This product has an exceptionally long life when correctly maintained. They are made to order and a wait of 2/3 weeks is normal. 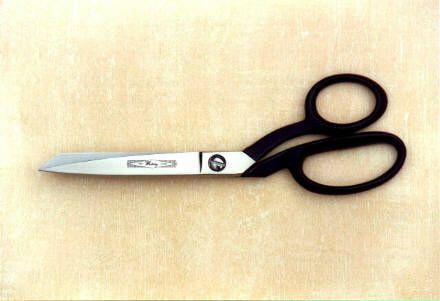 High carbon tool steel blades Ground and set by top craftsmen Extra wide handles with thumb rest Machined pivot screw option Manufactured in the traditional hand-made way by the most skilled craftsmen, these shears are designed to give excellent balance and comfort. This product has an exceptionally long life when correctly maintained. 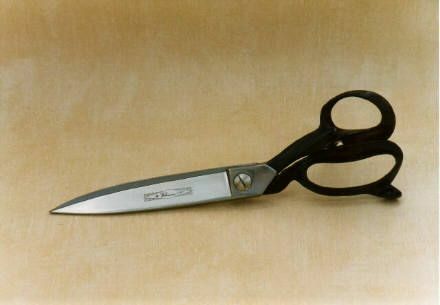 High carbon tool steel blades Ground and set by top craftsmen Extra wide handles with thumb rest Big bolt screw option. 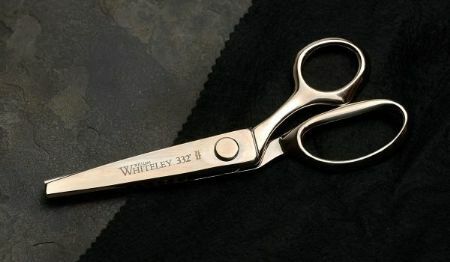 Manufactured in the traditional hand-made way by the most skilled craftsmen, these shears are designed to give excellent balance and comfort. This product has an exceptionally long life when correctly maintained.